U.K.-based Betfair is best known as a betting exchange and sportsbook, but the company also offers a full-featured online casino that is powered by Playtech. In 2013, New Jersey passed a law to legalize online gambling, and Betfair became one of the first licensed operators in the state. As part of this expansion, Betfair integrated other software including IGT and IGT-owned WagerWorks, which allows the casino to offer online ports of some of the most popular brick-and-mortar casino slot machines. All new members can receive £10 free with no deposit required! Be sure to click thru this link to qualify! And when you’re ready to make a deposit, choose between a 100% deposit match for up to £100, a slots only bonus for up to £1000 + 20 free spins, or the Live Casino bonus of £10 free. Betfair has a free mobile casino app, and when you try it out for the first time, you can receive a £5 free bet! Receive even more free money with Comp Points. Every real money bet earns you Comp Points which you can convert into real cash! 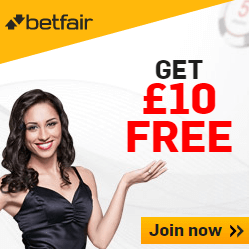 Click here to receive your £10 Free from Betfair Casino! Step 1: Click Here to visit the Betfair Casino and then click the “Accept” button underneath the Free £10 Bonus for all new Casino players promotion. Step 2: Complete the registration form. The Promo code/Referral Code will automatically get populated with the correct code to receive your no deposit bonus. At the time of this writing, the Betfair promo code that should get populated is CASREG – however, this could change. Step 3: Opt in to the £10 no deposit bonus promotion. Visit the Betfair website and navigate to the Casino tab, and then Promotions. Click on the check box to accept the terms and conditions and click the Accept button to receive your £10 free. No deposit required! Betfair will have to verify your account if you do not want to make a deposit at this time, which may require you to send in documents as proof of identity. Be sure to enter your correct information on the registration page to help verify your account! The verification may take up to 72 hours. Alternatively, you can make a real money deposit and your £10 no deposit bonus will automatically appear in your account. 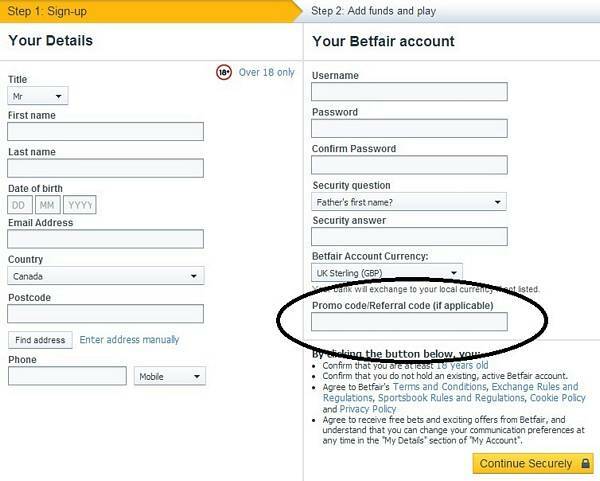 Once your account is verified, Betfair will email you a confirmation and your no deposit bonus will appear in your account after you log in. Your winnings may be withdrawn once you meet the wagering requirements, however the initial bonus value of £10 will first be deducted. The £10 no deposit bonus must be wagered 10x on slots before you are allowed to cash out your winnings. There is also a maximum amount of £25 that can be won from this promotion. Also, please note that you only have 3 days to satisfy the wagering requirements or else the bonus will expire including any winnings! Step 4: Make a deposit. When you are ready to make a deposit, you can choose the best welcome bonus for you. Betfair offers 3 distinct deposit bonuses and you can pick which one you want. All the bonuses are CASHABLE (can be withdrawn) after you’ve successfully completed the wagering requirements associated with each bonus. The wagering requirement represented below refers to the amount of the bonus you must play. For example, if you max out Welcome Bonus #1 and deposit £100 to receive the £100 bonus, you must then wager a total of 45 x 100 = £4,500 before cashing out the bonus. *Not all wagers count equally towards meeting the 45x wagering requirement. The chart below summarizes how much of your play qualifies towards satisfying the requirements. Your first deposit is matched at 100% for up to £1000 in bonus money. There is only a 30x wagering requirement on the bonus. You may only play slots with this welcome bonus option. Play £10 in the Betfair Live Casino and immediately get rewarded a £10 bonus. The £10 bonus has a 20x wagering requirment on it. Low risk roulette bets where you have 66% or more of the table covered will not count. All of the Betfair Casino bonuses are CASHABLE! So once you’ve met all the requirements, you can withdraw any bonus money and winnings that you have! Launched in 1999, Betfair has quickly established itself as one of the largest and most respected gambling brands in the world. The fact that it has a presence in the U.S. adds to its cachet immensely. Betfair Casino also distinguishes itself with mobile play that is more than an afterthought. If you have an Apple iPad, you will likely want to use it even when connecting to Betfair from home. The Betfair cashier makes it easy to move large amounts of money around, and the casino is known for fast, no-hassle withdrawals. The loyalty program is very lucrative for clients who can achieve the Platinum tier, and a Betfair Casino account provides you full access to all Betfair’s other products, including its sportsbook, betting exchange, poker room, bingo hall and so forth. In the live casino, Betfair also offers exclusive, private tables for high-stakes play. Click here to open your account at the Betfair Casino and receive your £10 no deposit bonus! Click here to learn about the world famous Betfair Sports Exchange and free bet offer. You can also read more about the Betfair Live Casino bonus here.